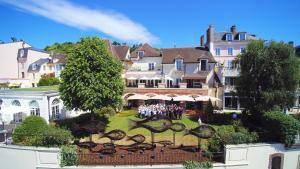 The Rive Gauche Hotel is situated alongside the Yonne river, set in grounds of 2 hectares (5 acres). The hotel offers 42 quiet rooms with all the amenities you would expect from a three-star hotel. All rooms have bathroom, toilet, colour television, direct dial telephone and mini bar and are available with double or twin beds. There is a free 60 space enclosed car park available so that you can park easily and safely. Hospitality is the keynote, and with our original, regional menu, you can dine in a pleasant, friendly atmosphere, with large picture windows overlooking the garden and the river. As soon as fine weather arrives, you can make the most of the sunshine on our terrace. When would you like to stay at Hôtel Restaurant Le Rive Gauche ? These are attic rooms with French windows, which will allow you to make the most of the garden or River Yonne view.An extra bed can be accommodated in this room. Some rooms are on the ground floor level with direct access to the grounds and a private terrace accessed by French windows. They can also be made into adjoining rooms, so there is room for all the family. From October to April, the restaurant is closed on Sunday nights. If you wish to have dinner on site, please reserve a table in advance. Each day we'll check prices and send you an email for your selected dates at Hôtel Restaurant Le Rive Gauche. If you don't have specific dates but would like to check prices for say next weekend or say next month we can check the price too. Click to write a review and share your experience of Hôtel Restaurant Le Rive Gauche with other travellers.